Home Tips 8 Tips , Awesome Penang Travel Experience! 8 Tips , Awesome Penang Travel Experience! 8 Must-Read Tips for an Awesome Penang Travel experience! Thinking of maximising your Penang travel experience while enjoying your Penang Tour? Or staying in a hotel in Penang and have no idea what else to do during your free time? Then you’re gonna love these tips we are providing you! These are very all specific tips to enhance your Penang travel experience, but if you’re wondering what you can do while you’re in Penang, check out the TOP 5 Things to Do in Penang article! TIP 1: For FOOD LOVERS! Your Penang travel experience is not complete without a good bowl of Assam Laksa and a freshly fried Fried Koay Teow. Penang is famous for its reasonably priced hawker/street food. Of course, there are good expensive dining spots in Penang as well but Penang street food is a MUST-TRY no matter where you come from. So, your No. 1 priority during your Penang trip should be to check out those famous stalls that serve cheap and good food instead of high-end restaurants here. 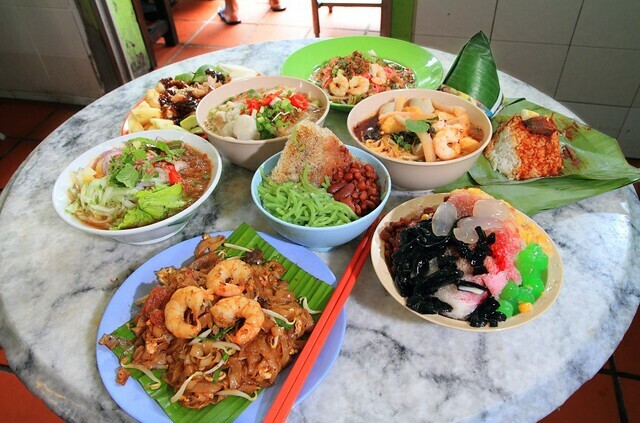 Here are some pretty awesome hawker food in Penang. When you’re in Georgetown, the city centre of Penang and you’re looking for something to eat, perhaps you should check out this TOP 10 unique food in Georgetown article. TIP 2: For SHOPPING ADDICTS! Shopping is one big aspect for Travel in Penang. You can shop at Gurney Plaza, Queensbay Mall, First Avenue, Komtar, Penang Times Square, Straits Quay and many more! Here’s a huge one: When you are bargaining, use Hokkien, the local dialect originated from China or get a local Penangite to help you with that. This is especially important when you are shopping at the night bazaar at Batu Ferringhi! Bring summer clothes. Penang is hot and humid all year long. Yes, all throughout the year it’s summer here in Malaysia, Penang included. You wouldn’t want to pack too much of your winter clothes here when you travel to Penang. TIP 4: For HERITAGE & HISTORY LOVERS! Before visiting those Penang Heritage sites, you might wanna read up some Penang Travel information about some of them. Some articles that contain photos/pictures of certain heritage buildings or some stories about some of the oldest buildings/places in Penang. These are the places that you might wanna visit during your spare time in Penang! If you love to discover more about Penang heritage, you might wanna consider staying in E&O Hotel Penang, Yeng Keng Hotel in Penang and other heritage hotels in Penang! TIP 5: For ART LOVERS! 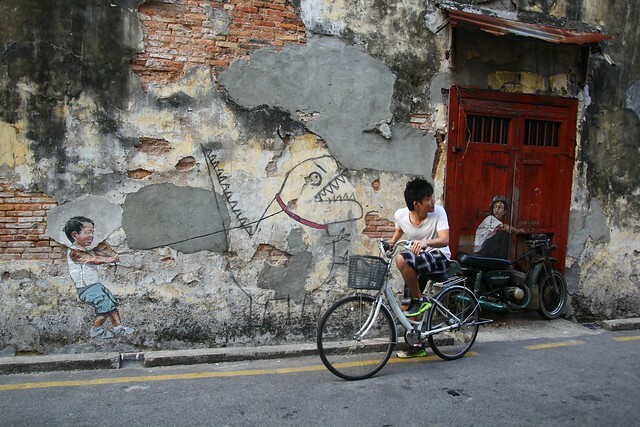 Discover the ‘other’ side of Georgetown, the artistic side for travel in Penang! Many people will tell you about the amazing mural drawings by Ernest Zacheravic all around Georgetown and that you should stroll around the city centre and start looking for it. Instead of by foot, consider adding cycling in Georgetown to your Penang travel experience! Here’s what a local Penangite did and see how much fun he had with his friends. Read about it HERE. TIP 6: For GREEN/NATURE LOVERS! Looking for a green Penang travel experience? Penang has a lot to offer for nature lovers! Travel to Penang and enjoy the natural breeze at Botanical Garden a lovely place to go in the morning or early evening, when it is still not so hot. Or just enjoy an adventurous day at Escape Theme Park at Teluk Bahang, a new nature-themed fun park that encourages physical wellness and re-connection with nature, all through play in the quest for fun. Escape is a new kind of Penang travel theme park that encourages kids to stay active and reminds them to love mother nature! Need a hotel in Penang that provides great greenery? You might wanna check out Shangri-La Rasa Sayang Resort and Spa, one of most popular 5-star hotel resorts in Penang for tourists. TIP 7: For BEACH LOVERS! 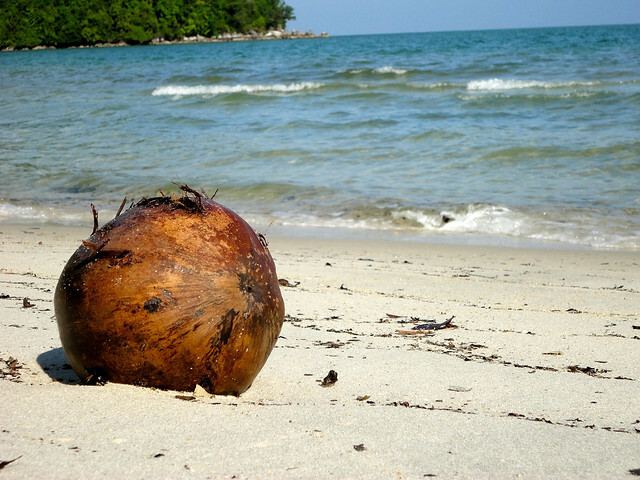 The fine beaches of Batu Ferringhi are one of the most popular Penang travel destinations. Gear up and have some fun with various water sports like water-scouter riding, Banana boating and jet-sking. Para-sailing and witness the stunning view of the beach from the sky wouldn’t be so bad as well! And while you are here, you really should stay until evening, where the famous Batu Ferringhi night market starts at around 7pm. It’s really a pretty good place to do some shopping for souvenirs and is one of the most popular activity for travel in Penang travellers. If you wish to spend the night in a Penang hotel that is in Batu Ferringhi area, check out our 15 popular hotels in Batu Ferringhi, Tanjung Bungah and Teluk Bahang post! Penang Hill is one of the most popular Penang travel hot spots. If you are spending a night at Penang Hill, you wouldn’t want to miss the stunning sunrise from the summit. Expect a spectacular panoramic view of Georgetown, the mainland, Penang bridge and the Straits of Malacca from the top of this awesome Penang travel attraction.